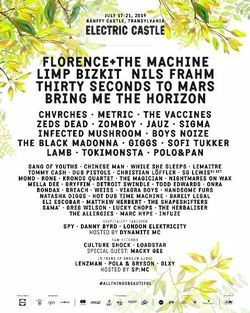 Florence + The Machine, Thirty Seconds to Mars, Limp Bizkit and BRING ME THE HORIZON will headline EC7. Other acts confirmed: Metric, Boys Noize, The Vaccines, Chinese Man, While She Sleeps, TOMM¥ €A$H, SOFI TUKKER, Kronos Quartet, MONO (Japan), Viagra Boys, Lemaitre, Handsome Furs. Hospitalitydnb takeover: S.P.Y, Danny Byrd, London Elektricity, Dynamite MC. Cel mai iubit festival de muzica din Romania, Electric Castle, este o experiena completa de festival, ce are loc timp de 5 zile, pe domeniul Castelului Banffy din Cluj, in Transilvania. Prin mixul dintre lineup-ul eclectic, conceptul architectural, tehnologie i arta contemporana. EC vrea sa revoluioneze modul in care tinerii interacioneaza cu un festival de muzica, rupand barieriele dintre mainstream i culturile underground. The most beloved annual music event in Romania, Electric Castle is a unique and genuine 5 days festival experience that happens every year at the Bánffy Castle domain in Bonida - a tiny historic village near Cluj Napoca in Transylvania. By mixing arts and technology with an eclectic musical line-up, unique architectural concept and the breath taking scenery of the amazing medieval castle, Electric Castle redefines the way people interact with a music festival, breaking the boundaries between electronic music and reggae, mainstream and subculture. Last year over 212.000 people flooded the festival grounds. EC7 will take place July 17-21, 2019.